With temperatures around many areas of our nation, and indeed the globe, soaring to record heights so early in the season, and with ominous news of polar ice caps melting...as in fast...as in by the next 30 years....there is certainly no more timely event then the Live Earth event set for Saturday, July 7. At the time of this writing, it has already launched in Sydney, Australia. 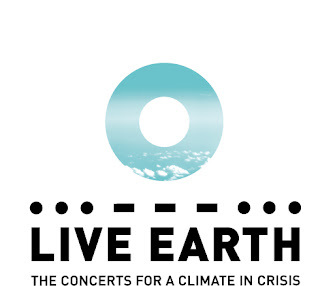 Live Earth is a 24-hour, seven-continent music festival designed to raise awareness for global warming. The event, the brainchild of Emmy-winning producer Kevin Wall, will feature a number of artists including Bon Jovi, Shakira and Madonna. Former U.S. Vice President Al Gore is chairman of the Alliance for Climate Protection, the event's main partner. Gore says that while a number of initiatives are underway, more action is needed to help curb climate change worldwide. According to an article in The Washington Post, a potential viewership of 2 billion could be watching Saturday, between web broadcasts, television, live stagings, and more communications vehicles then ever before in history--although there are no distinct estimates on how many viewers there will be. If you haven't checked out the web site yet, it is a must. I have been reviewing it over the last few days, and seen some of the most amazing video I have seen in a while, including a very poignant film about saving our coral reefs, narrated by a child, and an excellent film featuring Richard Branson, and Jewel, in which an expedition to the Canadian Arctic highlights the Inuit people and how their lives have changed due to global warming. "If enough people come together to fight against the climate crisis, corporations and governments will have no choice but to act as well," Wall said in a statement about the event. 1) Replace your incandescent light bulbs with compact fluorescent lights (CFLs). CFLs last 10 times longer and use 66 percent less energy than incandescent bulbs while delivering the same light levels. 2) Turn down the thermostat just three degrees in the winter and up three degrees in the summer. You can prevent the emission of nearly 1,100 pounds of carbon dioxide annually. 3) Inflate your car tires to improve your gas mileage by about 3.3 percent -- a savings of about 7 cents per gallon. It's the right thing to do for your wallet and the right thing to do for the Earth. 4) Turn down the hot water heater. Set your water heater to 130° F. While you're at it, turn down your house thermostat during the winter to 55° F when you go to bed or leave home. These simple actions can have enormous positive consequences, preventing the emission of more than 1,100 pounds of carbon dioxide over the course of the year, while cutting your energy bill by more than 10 percent. And that's just from you! Get your friends on board, and the benefits will multiply. 5) Choose your seafood wisely. We can't afford to wait until 2008. The world's seafood will be entirely depleted by 2048, according to an early November report in the journal Science. That means the moment to shape up is now. By buying and eating certain types of seafood, you can discourage harmful fishing practices and avoid the more depleted or threatened species. Take a look at Seafood Choices Alliance or Seafood Watch to make smart choices. 6) Purchase EnergyStar-labeled appliances. EnergyStar products are among the top 25 percent most efficient and can provide a 30 percent return or better through lower utility bills. 7) Wash and rinse in cold water. If everyone in the United States alone switched to cold water with their washing machines, we could save about 30 million tons of carbon dioxide each year -- and more than $3 billion in energy costs, collectively. And what's more? Cold water cleans your laundry just as well as hot water. 8) Buy locally produced meats and produce. Sounds like a good idea, but you don't know where to start? Just type in your zip code on Local Harvest's website to see a list of farms and farmers' markets close to home, as well as nearby restaurants committed to supporting their neighbors. Buying locally produced food cuts out the middlemen and the vast amounts of energy required to get your products onto store shelves. Most produce in U.S. supermarkets travels an average 1,500 miles before it is sold! 9) Drink more water from reusable glassware. It's great for your bank account, your health, and your planet. The average American consumed more than 400 beverage bottles and cans in 2006, leaving behind wasted glass, plastic, steel, and aluminum. Reduce, reuse, and recycle. 10) Walk, bike, and carpool. In the United States, the car represents one of the largest sources of greenhouse gas emissions. Hybrid cars can get twice the fuel efficiency of the average new car, cut greenhouse gas emissions by half or more, and reduce urban air pollutants. Carpooling saves energy, cuts on additional pollution, and allows you to take a turn as a passenger instead of driving everyday.